Community Bank of the Chesapeake leaders present the College of Southern Maryland with $20,000 toward its endowment and scholarship fund. From left, CSM Director of Development Chelsea Brown; CBTC Executive Vice President and Chief Lending Officer Greg Cockerham, a 1974 alumni and CSM Foundation Director Emeriti; CBTC Executive Vice President and Chief Administrative Officer and CSM Foundation Director Christy Lombardi; CSM President Dr. Maureen Murphy; CBTC Chief Executive Officer William “Bill” Pasenelli; CBTC Chief Operating Officer and CSM Trustee Jim Di Misa; and CSM Vice President of Advocacy and Community Engagement Michelle Goodwin. 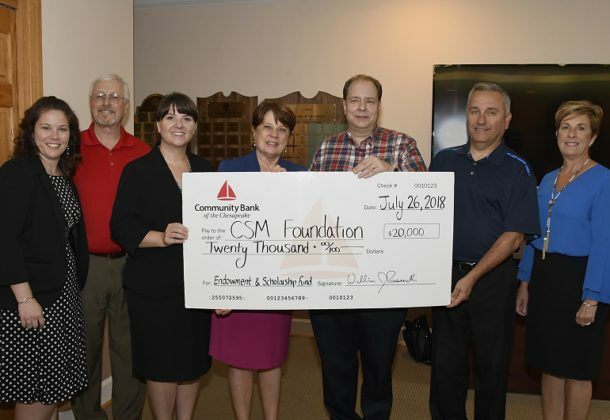 A $20,000 check to the College of Southern Maryland Foundation on July 26 was part of the Community Bank of the Chesapeake’s five-year pledge to fund an endowment fund and an annual scholarship fund to support credit and workforce development students at the college. “Our ongoing support of the College of Southern Maryland is unwavering,” said CBTC Chief Operating Officer Jim Di Misa of the bank’s commitment to CSM and its students. Mr. Di Misa also serves on the CSM Board of Trustees and is the trustee representative to the CSM Foundation. “We value the educational opportunities this partnership brings to the students and families in our community,” he added. Scholarships funded by CBTC are distributed by the CSM Foundation. To be eligible, a credit student must reside in Calvert, Charles, or St. Mary’s County, possess a high school diploma or equivalent, have and maintain at 2.5 cumulative grade point average, and be studying in the field of business administration. Workforce development students must reside in the tri-county area, have a high school diploma or its equivalent, and be enrolled in a career development program. Preference will be given to students who demonstrate financial need. For information on scholarships at CSM, visit the college’s website. For information on establishing a scholarship at CSM, visit the foundation’s website.